@Bet2Win wrote: Well I like Courtney, then and now, not too many did other than Kasha and IIRC Brill. Fan base of 3. @Kashathediva wrote: LOL Earlier tonight I was thinking of one of my favorite lines from this show: (Paraphrase Courtney) "How'd that taste coming out of your mouth". Yeah, I do like Courtney. Courtney didn't bother me on her season. I bought her book which for me was merely a desire to see what she had to say about how the show "works" behind the curtain as they say (and I'll buy Amy Kaufman's new book for the same reason). But after reading the book I started liking her a bit - she just struck me as very human and well aware of her own flaws and owned her mistakes. After listening to her stand up for Arie (who may well be her closest friend and she may well be his closest friend) I like her all the more. On her podcast with RS she has shared what I believe is the clearest vision we could ever get of the love Arie has for Lauren. IMO we are not just imagining the things we see in the body language of this couple - they are very real. It’s great to see so many of our favs match up and even if they don’t it’s all in the eye of the beholder ! Des & B R O O K S! - my absolute favorite contestant & was so fooled by that spoiler! Team Rachel no matter what! Arie and Lauren might take the cake though. It's one of the most genuine love stories for me. 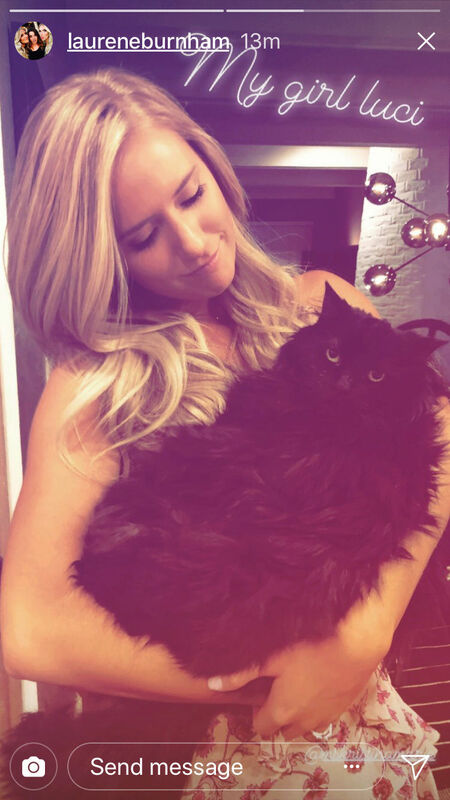 Does Lauren have a cat? Thanks for bringing this over, @TheWrongReasons. Brooks...I didn't care for him on Des's season, but absolutely loved him on BIP. He has an adorable personality that wasn't shown on TB'ette, very charming. And this is the gripe I have about MF, he takes a theme of a contestant, and that's all he shows, running it into the ground. And probably why Emily's season was one of my favorites, with Ali's a close second...we actually got to see more than one side of the contestants. My big beef with this show is the recycling of contestants to leads. In their quest to set up story for next lead ... they fail to show us what’s really happening in the current season. Okay here goes: These are the couple I liked together but My favorites marked with a star and a heart the best ever for me. Many seasons I started to watch but lost interest early. Yeah, I'm curious as well. Maybe Luci is her parents' cat? In an interview they said they would be moving Lauren's dog to AZ. I don't recall them mentioning a cat. I pretty much like all the couples who have come out of any of the shows that have stayed together. I really was unsure about Arie since my view was tained by reality steve. Though I am holding out a lot of hope because of what courtney said and because in the past the bachelor couples have all been wrong accept for one shawn. The second that got it right was the second pick so I feel like there is good odds! I really do like him and Lauren what a sweet couple.